NEW YORK, Nov. 25, 2013 -- The Toy Industry Association (TIA) announced today the 84 toy, game and property finalists for the prestigious 2014 Toy of the Year Awards (TOTY). The annual awards program is sponsored by the toy industry itself to recognize the top toys available across 12 categories -- from e-Connected and Activity to Educational and Outdoor toys. Because the finalists have been nominated from within the industry and winners are selected by a combined vote of toy manufacturers, retailers, media and consumers, the TOTY Awards are known as the "Oscars" of the industry. NEW YORK, Feb. 7, 2013 -- ZeptoLab®, the entertainment and gaming company behind the global mobile phenomenon Cut the Rope®, is bringing even more ways for fans to interact with the lovable monster, Om Nom. With over 300 million downloads plus successful media extensions, Cut the Rope and Om Nom have become major icons of the digital entertainment era. Debuting at this year's Toy Fair is Om Nom: Candy Flick™, a new augmented reality game that allows fans to interact with Cut the Rope's candy-chomping star Om Nom, like never before! Om Nom: Candy Flick, available on Apple's App Store, is unlocked via a special tag that can be found on a variety of Om Nom plush toys from toy partner, Round 5. Once downloaded, fans can bring Om Nom to life by positioning their smartphone or tablet's camera on the tags and watch as he virtually pops out of the tag ready to devour his favorite treat... candy. World-famous doll company tackles zombie romance with their latest release of R and Julie from Summit Entertainment's #1 film Warm Bodies. The figures are now available for pre-order at http://www.tonnerdoll.com. KINGSTON, N.Y., Feb. 11, 2013 -- Tonner Doll Company, an award-winning designer and manufacturer of high-end collectible dolls and figures, has released Character Figures® based on Summit Entertainment's Warm Bodies. The film was released nationwide by Summit Entertainment, a LIONSGATE® company, on February 1, 2013, and was the #1 box office hit its first weekend. "I read the book a while ago after a friend had suggested it," said Robert Tonner, doll artist and company CEO. "When I found out there would be a movie, I just had to jump at the chance to get this license." Sculpted in the likenesses of the film's lead characters, R and Julie, Tonner's figures will allow fans and collectors alike to bring home their very own, collectible example of the power of human connection. New York, NY -- February 19, 2013 -- The 110th American International Toy Fair opened its doors to a surge in international attendees last week, as tens of thousands of visitors from 92 countries descended upon New York City to preview 150,000 innovative toys, games and youth entertainment products at the largest toy tradeshow in the Western hemisphere. Owned and operated by the Toy Industry Association (TIA), Toy Fair 2013 (Feb. 10-13) welcomed a 4% increase in international attendees, a 9% rise in licensors, a 6% increase in international manufacturer's reps, and an 18% surge in foreign press visiting from 20 countries. Total attendance during the four-day show was 24,145. Los Angeles, CA – February 10, 2013 – Spin Master Games and Warner Bros. Consumer Products have teamed up to create Stratego – The Hobbit: The Desolation of Smaug Game based on The Hobbit Trilogy, including the blockbuster The Hobbit: An Unexpected Journey, as well as the highly anticipated second and third films, The Hobbit: The Desolation of Smaug and The Hobbit: There and Back Again, productions of New Line Cinema and Metro-Goldwyn-Mayer Pictures (MGM). "Building on the success of The Lord of the Rings Trilogy, we are excited to partner with Warner Bros. Consumer Products on games for The Hobbit: The Desolation of Smaug," said Ivory Jones, Brand Manager Games at Spin Master. "Our 'Stratego – The Hobbit: The Desolation of Smaug' Game lets The Hobbit Trilogy fans and strategy-game fans alike relive the excitement and fantasy of the films." MONTREAL/NEW YORK, Feb. 10, 2013 - MEGA Brands launches its brand-new Mega Bloks Hot Wheels™ collection today at the 2013 American International Toy Fair. Toy insiders will get a full preview of the highly-anticipated construction line hitting stores this summer. Following their successful launch of the Mega Bloks Barbie line in Holiday 2012, MEGA Brands and Mattel continue to expand the construction category with a full range of building sets based on the iconic and best-selling Hot Wheels® brand. 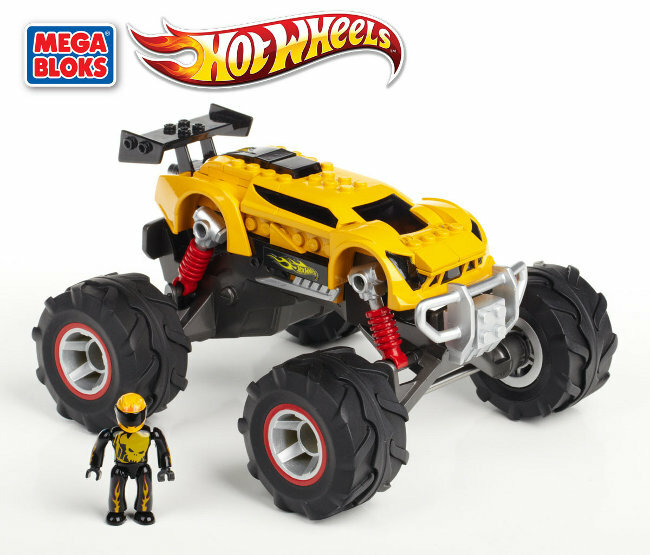 Mega Bloks Hot Wheels brings together the speed, action and performance of this world famous boys brand with easy building fun, cool action features and the world's first collectible Hot Wheels micro-action-figures.